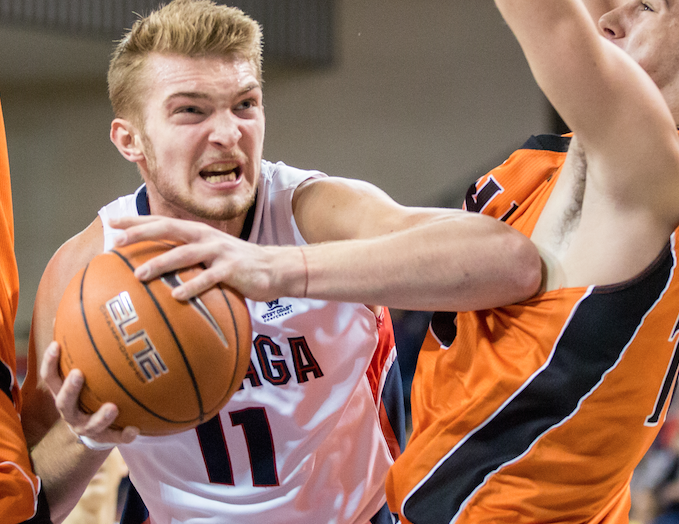 You won't like Sabonis when he's angry. In December of 2006, Gonzaga played Washington for what they knew would be the last time in quite a while, and they made the most of it. The Zags, in their first post-Morrison campaign, slaughtered then then 13th-ranked Huskies 97-77 in Spokane. The rivalry went cold after that, with the schools putting the annual matchup on an infinite hold. There had been a lot of beef about Gonzaga and UW going after the same recruits and rumors of other squabbles between the coaching staffs and athletic departments. Since then, the Zags and Huskies haven't squared off, which is a shame because in some of those years, both schools had very good clubs. People really wanted to see them play again and state Rep. Michael Baumgartner even introduced a bill that would require the cross-state rivals to take the floor once a year. But without any legislative help, the UW-Gonzaga series is returning next season and will alternate between Spokane and Seattle going forward. That said, the party is getting started early tomorrow thanks to the scheduling committee at the Battle 4 Atlantis, an elite, swanky, slightly futuristic basketball tournament tipping off in the Bahamas tomorrow. Gonzaga and Washington are set to face off in the opening round of the tournament, which also includes Texas, Texas A&M, Michigan, Syracuse, UConn and Charlotte. It's an impressive field, to say the least. As if it wasn't odd enough that teams separated by less than 300 miles would travel to foreign soil to do battle, there are a few other weird things about tomorrow's game. First off, it's being played at 9 am Pacific time, which is not exactly when college athletes are at their most lively and active. Also, the game comes just two weeks after both schools played games in Asia and are likely a little air weary. Gonzaga went to Japan to play one half against Pitt before the court became a slippery deathtrap and the contest was called off. Washington, on the other hand, went to China and defeated Texas in a game made most memorable by 23 points from Husky guard Andrew Andrews and the verbal insanity that rolled out of color commentator Bill Walton's mouth on the television broadcast. Adding to the weirdness, Washington would play Texas again, should both the Huskies and Longhorns emerge victorious tomorrow. So how do they measure up? Well, all the aforementioned variables could play a part, as will the fact that this is a rivalry game...although played in front of likely very, very few students in what looks more like a Barry Manilow concert set up than a college basketball arena. The Huskies are very, very young — Andrews is the lone senior and there's only a pair of juniors on the roster. But freshman Marquese Chriss and Noah Dickerson have played very well. Chriss scored 29 points against Mt. Saint Mary's in the Huskies' 100-67 win. Again, the game is at 9 am PST and you can watch it on ESPN because your boss has probably already left for Thanksgiving.